I hesitate to write this article. On one hand, I really want to get the word out about a fantastic festival that is supporting a great cause and has an interesting history. On the other hand, I want to keep it just like it is. The Aiken Bluegrass Festival is held each May at the fairgrounds in Aiken, South Carolina. The fairgrounds themselves are not particularly pretty, like Delfest, and there is no shade from the late Spring Southern sun. This is not Horning’s Hideout. It can be dusty and windy. But there is something special about that hard-packed field in southwestern South Carolina and the people that attend this festival. Each year, kids and parents, grandparents and college kids and music lovers of all ages gather for two days of camping, dancing and everything else involved in a festival. The people at ABF are united in support of two things: bluegrass music and STAR Riding. STAR Riding is a therapeutic horseback riding program in Aiken that helps those with disabilities improve their quality of life through safe interaction with horses. Each year, all of the proceeds from the festival go to support the program. Last year Schaumann wrote a check for $20,000. He expects this year to be more. The festival was founded by Steve Groat, Schaumann’s father-in-law, in 2004. He died of cancer in December of 2014. The festival has grown year after year, very organically, via word of mouth and social media. 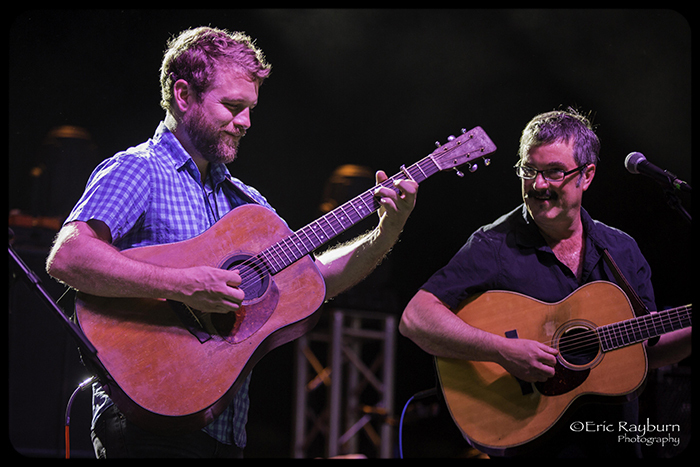 Those in attendance this year saw a lineup headlined by two nights of Greensky Bluegrass along with two different incarnations of The Larry Keel Aiken Experience. 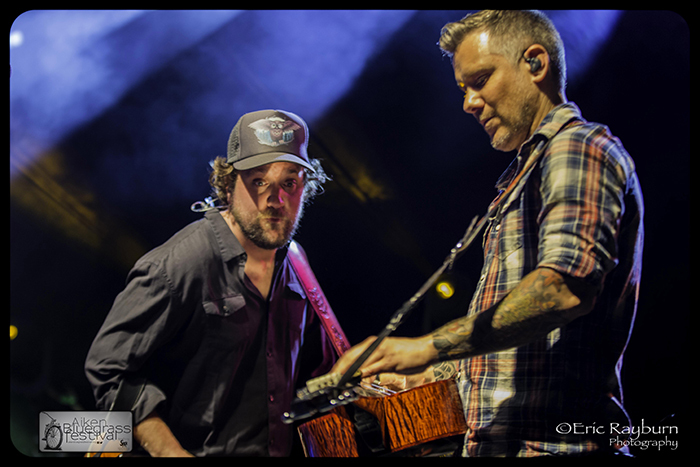 Friday night had special guests Jeremy Garrett and Andy Hall of The Infamous Stringdusters along with Jon Stickley, while Saturday saw GSBG’s Dave Bruzza, Paul Hoffman and Anders Beck join Keel. Others over the weekend included Jon Stickley Trio, Town Mountain, Delta Cane, Doug and the Henrys and Clyde’s on Fire. Friday was kicked off by local Aiken band Doug and the Henrys, who brought a tenor take on classics like Johnny Cash. 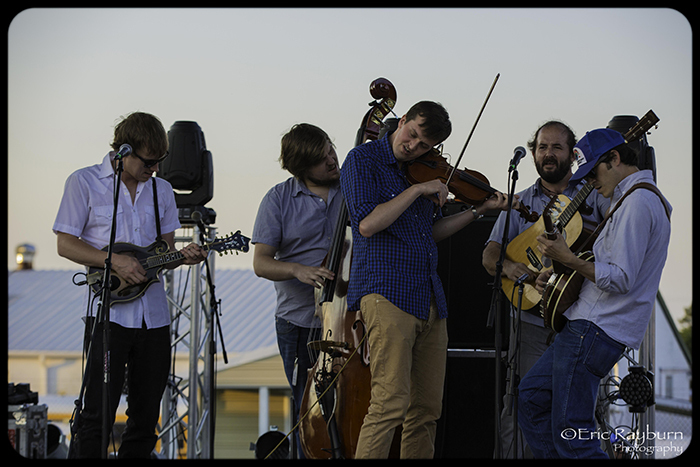 Asheville, NC’s Town Mountain followed with their rough-hewn traditional bluegrass. Led by the fiddle of Bobby Britt, they had the gathering crowd out of their chairs and dancing. Greensky Bluegrass closed the night with a set that started off with a ten minute cover of Bob Marley’s “Could You be Loved” and included many songs from their newest release “If Sorrows Swim”. Britt and Garrett joined the Kalamazoo, Michigan quintet for “Demons” and “Clinch Mountain Backstep”, but not before dobro player Beck led the crowd in singing “Happy Birthday” in honor of Britt’s birthday. The set ended with another cover, Bruce Springsteen’s “Atlantic City”. Saturday was a full day of music and events that included a sidewalk chalk art contest. 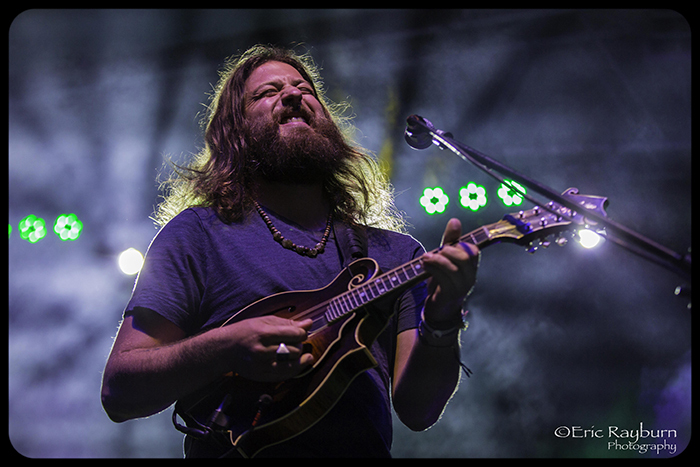 The contest, for kids up to age 15, was judged by Greensky’s mandolin player Hoffman and bass player Mike Devol. 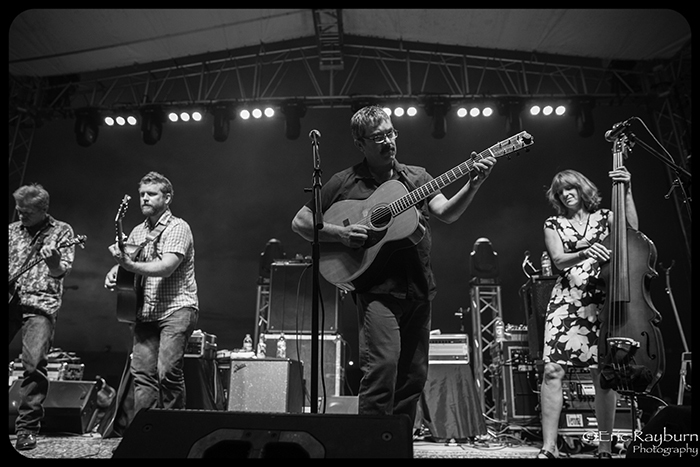 The performances on stage added a pair of Asheville-based artists, Clyde’s on Fire and the Jon Stickley Trio. The Trio, featuring Stickley on guitar, Lyndsay Pruett on fiddle and Patrick Armitage on drums, recently finished recording its latest album which was funded via a Kickstarter campaign (due out later this summer). The Stickley Trio’s jazzed-up, flat-picking bluegrass had the swelling crowd dancing and smiling while the vendors of clothing, food and beer did a brisk business. Guests rode carnival rides or sat in hammocks provided by ENO as the sun started to set. That evening’s Larry Keel set featured 3 members of GSBG (Hoffman, Bruzza and Beck) and offered a rare sight as guitarist Bruzza took up residence behind the drum kit for a few songs. This added depth to “Little Miss Can’t Be Wrong”. Keel has earned the nickname of “Mayor of ABF” as he has played every year at the festival and always leaves everything on stage, holding nothing back. This year was no exception. Every year, this special weekend in Aiken, SC has gotten better and better. Next year should only add to the importance, and as comfortable as the boys from Greensky have become at the festival, I wouldn’t be surprised to see them back next year.